CBT's at our East Grinstead, Crawley & Burgess Hill sites from £100. £100 on your bike, £115 using our bike, so bike hire, fuel, and certificate all inclusive. Why not treat yourself or someone else for with a CBT GIFT voucher? Just £115 for a great day of excellent and fun tuition! Please note: The CBT gift voucher is valid for 12 months. Own Bike / Renewals (using your bike) £100. It’s a long and busy day, but we do our best to make it fun and whether your goal is to ride a moped, scooter or motorbike short or long term, the CBT will teach you the basic essentials before you go into the world of 2 wheels. Your safety is always paramount, luckily MTS Sussex has the largest training site in the area, so plenty of room to practice! For more information see our CBT Frequently Asked Questions. You’ll be signed in and have chance for a cuppa & to meet the other CBT’ers for the day while we check your licences. An introduction to your MTS instructors and the day itself, including a chat about essential safety clothing & equipment. Element B - Tally Ho to the bikes! Now you get to know about the bike you’ll be using on the day. We won’t have time for a mechanics course I’m afraid but we will chat a bit about basic daily & weekly maintenance, and you’ll be shown how to safely use your bike stand. No muscle needed it’s all just technique! Element C - Ride ‘em cowboy! Here we go with the bit you’re all anxious about; learning to ride the bike. Once you’re pulling away and stopping safely, we will cover all types of riding skills necessary including slow speed, appropriate observations, maneuvering, junctions, using signals, gear change, and lots more. This is all within the safety of the MTS Sussex fenced off enclosure which is the largest of its kind in the area! So lots of room to practice as it’s a big part of the day, but you’ll be amazed how much fun you can have putting it all in place. Here the emphasis is on road safety, so we’ll talk a bit about what to expect out on the road, we’ll cover some highway code, and general safety points as well as a quick re-cap on what we have practiced on the training pad. Element E - What you’ve all been waiting for! 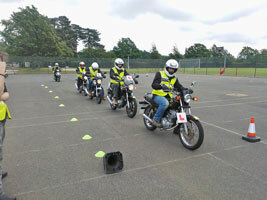 The CBT road ride lasts for at least 2 hours, during this time you will be in radio contact with your instructor. For safety reasons we have a maximum ratio of 1 instructor to 2 students, and we try to match students of equal ability. The road ride covers what we call a ‘nursery route’, which takes us around quiet side roads and housing areas just to get used to being on the road before we meet with any traffic situations. Once ready, we will continue to cover as many aspects of daily riding as possible. Your MTS instructor will talk to you about your day and the road ride and offer any advice they may have. If they’re happy with your ability to ride safely you will be issued with a CBT certificate which will last for 2 years or until you pass your full bike test whichever comes first. If you have asked to be assessed during the road ride for further training, your instructor will now be able to advise you of your options. Your valid UK licence (or counterpart if non UK) with the correct entitlement: either category A, AM, F, K, P, Q, or A1. If you have an old style licence please also bring a valid passport for ID. Lunch..yes we will let you eat at some point! You’ll be working hard and hopefully learning lots, so you’ll most definitely have an appetite by lunch time. If you’re not big on packed lunch make sure you bring some money with you as there’s a shop & café just round the corner of our East Grinstead and Crawley sites an on site Costa cafe at Burgess Hill where you can buy your instructors lots of chocolate..oops, I mean you can grab a bite to eat! At our Crawley and East Grinstead sites there’s always tea, coffee, juice and water. In our kitchens there’s a fridge and microwave for your use too. The leisure centre at Burgess Hill has plenty of vending machines as well as a Costa cafe for you to visit, and of course toilets! MTS Sussex all inclusive price for a CBT £115, no hidden bike hire, fuel, equipment or certificate charges. If you are riding your own bike it’s only £100 for the whole day! In 1990 the government introduced the CBT (compulsory basic training) which everyone has to complete to ride a moped or motorbike on the road unless they passed their car test prior to 1 February 2001. In this instance riding a moped up to 50kph/31mph without a CBT is legal albeit not recommended. How much does CBT training cost? - From £100 (using your own bike) £115 including use of a school bike. Can I book a CBT online? - You can use our online CBT booking or give us a call to get your CBT booked, whichever suits you best. You must pass your full motorcycle test within 2 years or you’ll need to complete the CBT again. Please note: You must bring your valid UK licence (counterpart & EU licence) For your safety you must be able to communicate in English & have a basic knowledge of the highway code to complete any training with MTS. You must also hold a UK drivers licence (or UK counterpart) and wear appropriate clothing and footwear and without this you will be sent away and forfeit your training and fees. The list is non exhaustive but includes a minimum of jeans without holes, rips, tears, not shorts, skirts or track suits, and you must have boots (non steel toe cap) for all training beyond CBT, and sturdy footwear (ideally boots non steel toe cap) not sandals, Crocs, deck shoes or similar for CBT. See the Driving Standards Agency Compulsory basic training (CBT) syllabus and guidance notes. If you are simply looking to renew your CBT our reduced rate is just £100 so long as you ride your own bike. Give us a call and we’ll fit you in with a CBT day that suits you, keeping you on the road for another couple of years. Call us on 01444 246714, 01293 850802 or 01342 890006, or email us at [email protected] or use the on-line contact form.